Ever since I first heard about this place, I have wanted to check it out. 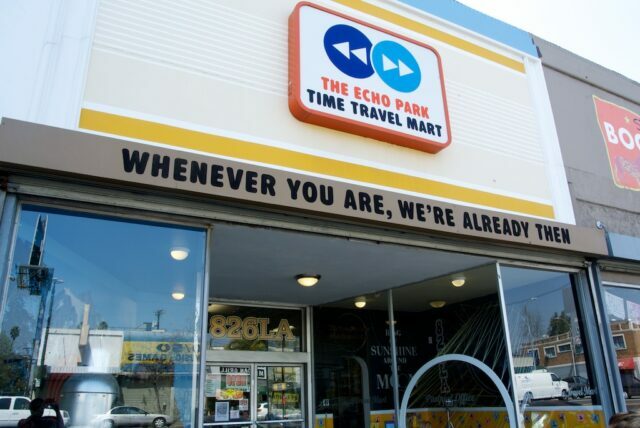 I mean, how can you not love a store that tells you it is selling to all parts of time as an official time travel mart? When I walked into the store I got even more excited because I was greeted by the man behind the counter telling me “hello again, I saw your future self in the store today, he told me you would be coming in.” That inherent cheesiness is what makes the Time Travel Mart such a success. Also, once you get to know them, you realize it is merely a front to provide funds for 826LA, their center for reading and writing that helps all the neighborhood children to succeed. Read on for my full review. Based on what the man working behind the counter told me, they have multiple stores like these in cities like Chicago and San Francisco. Chicago’s is a spy shop called The Boring Store, and San Francisco’s is a Pirate shop. The story goes like this: the man who started the first reading center in San Francisco was told by the city that he needed a storefront, so he set out to create the silly pirate shop that has become the flagship for their stores so that he could continue his nonprofit. This was such a success that he tried other ideas for his different locations. 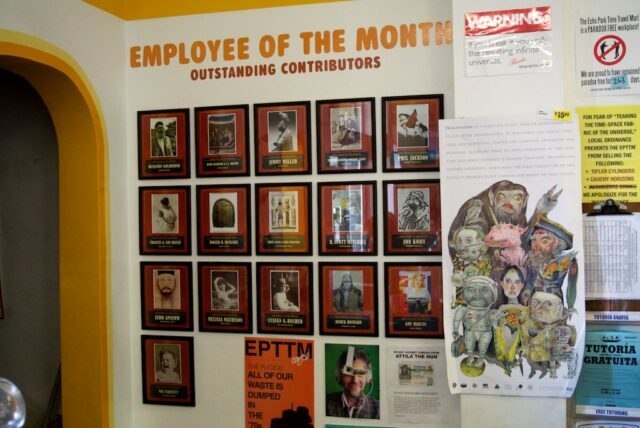 The store itself is part of 826LA — a non-profit tutoring center for students and budding literary enthusiasts ages 6-18. It specializes in after-school tutoring, workshops, and programs. The kids are encouraged to be creative and once a month one of their stories gets published and put into the store for people to purchase. They also teach the kids skills like music and created a CD of original lyrics the kids wrote. These songs have been performed by bands like Cold War Kids, Fiona Apple and She and Him. 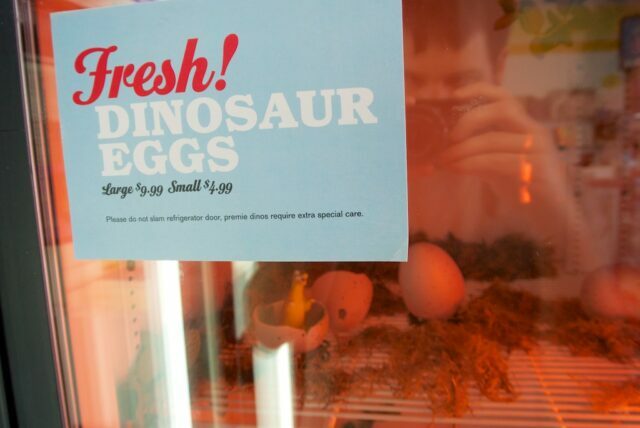 This is such a cool idea that makes me like the store even more. 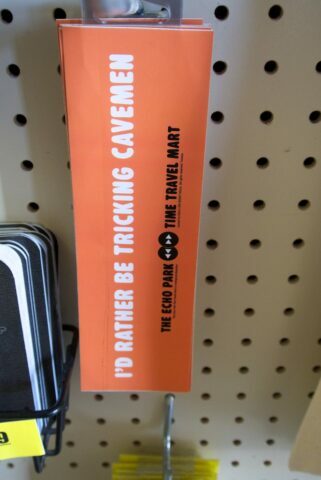 Now that we have gotten the history and awesome non-profit stuff out of the way, we can talk about the epic store that is The Time Travel Mart. I fancy myself to be somewhat of a nerd, and I could just as easily have a blog that debates the subtler points of the new Batman comics as a travel blog, so I am a fan of things that are unique like this. 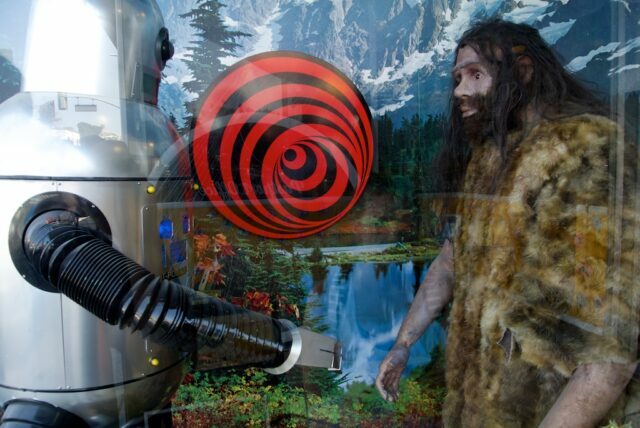 The store itself is pretty small, but from the moment you walk up to it and see a caveman shaking hands with a robot you know, it’s going to be fun. The three small aisles are broken down into different time periods, catering to their time traveling customers. 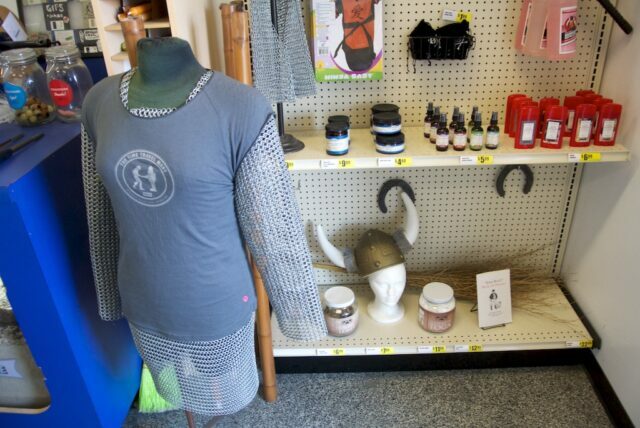 The oldest section has barbarian, chain mail and dinosaur stuff. A middle ages section has gems like medical leeches, cause who wouldn’t want those? 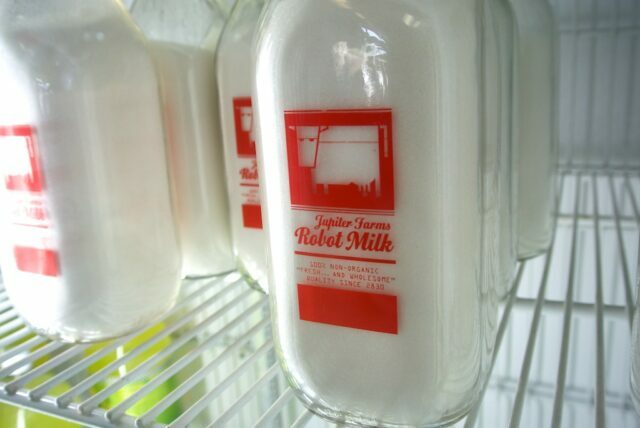 The future section has robot milk and ray guns. There is also a section dedicated to the work the kids have been creating in their program. 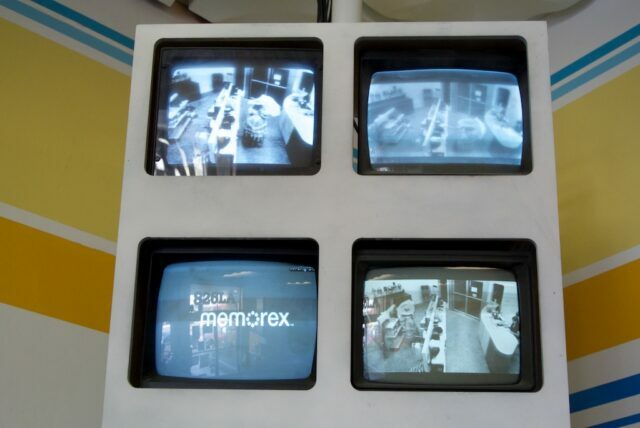 Every detail of this store is thought out, the employee of the month program spotlights people from all periods of history and the surveillance camera in the corner shows cavemen, robots and Victorian people all walking the store on its four screens. This is one of those places you just keep laughing at. 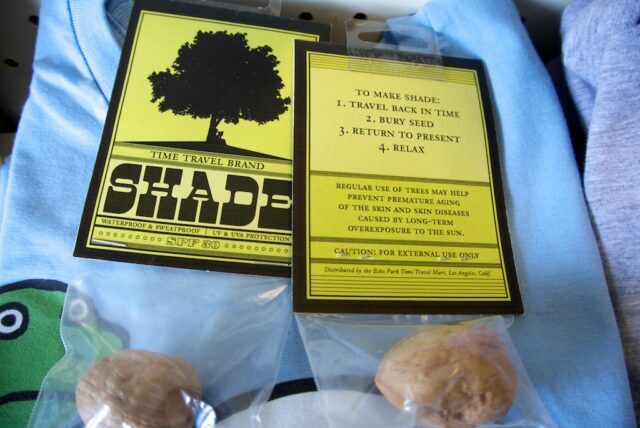 My personal favorite was the shade tree with directions that stated: “take seed, travel back in time, plant it, return to the present and relax under your tree.” It is the little things in life. The guy working behind the counter said almost everything in the store is made by the people that work there, and while the prices seem high, all of the proceeds go to the nonprofit. This makes it easier to spend your money on an “I would rather be tricking cavemen” bumper sticker or a new can of barbarian repellent. 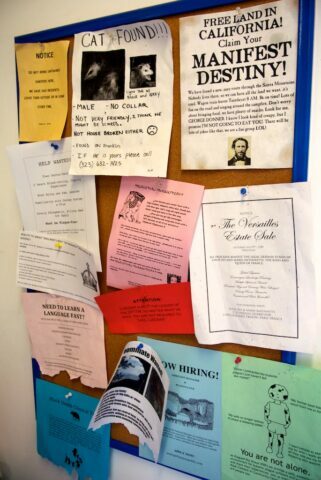 Lastly, they have a “wanted ads” section in the back of the store that has everything from volunteers to solve the bubonic plague to a future message about finding a cat which is a possum, super fun. As you can tell, I loved this store. It is small in size but big in heart, and I was happy to purchase something that benefited the kids they were working with. I recommend you check it out for yourself, you can get directions below, and if you are from the future, you can shop online as well.